Welcome to Chocolate Friday! Another weekend is beginning - I hope you have a fun one planned! 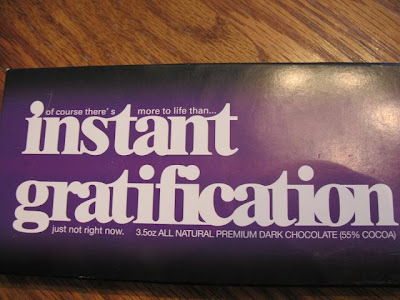 In case you can't read it, it says: of course there's more to life than...instant gratification...just not right now. Cute and funny! 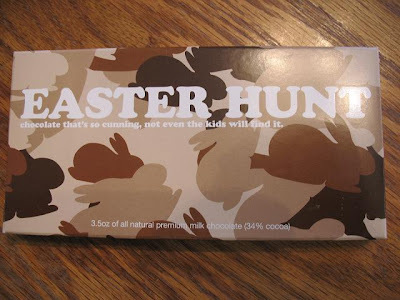 It says: Easter Hunt - chocolate that's so cunning, not even the kids will find it. Now that is a good idea - camoflauge chocolate that the kids can't "see"! I won't put all the words here for you, but basically it gives you directions how to turn this bar of chocolate into a chocolate egg. 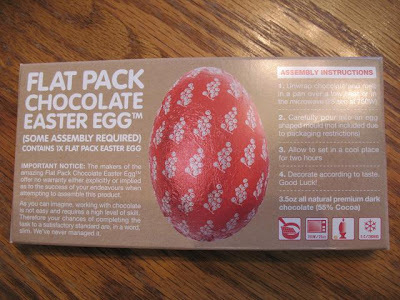 There are instructions to carefully melt the chocolate and pour into a mold (which they notify you is not included!) and all the rest of the steps. It would take a lot of work - LOL!! You can check out your local Safeway to see if they have them. I think they make a great gift! What chocolate do you have for me today?? C'mon - you have to share! 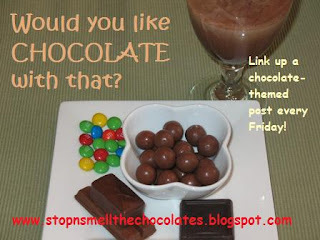 Find or write a family-friendly chocolate post and come back to link it up to Mr. Linky. You can find more info here. If the links aren't working, then please leave your link in the comments. Thanks. Have a beautiful blessed chocolatey weekend! Those are too cute! It would be "fun" to eat! Yeah, that's it. FUN! I think my pictures are working now if you want to come back and look at today's funny. *sigh* I could see them fine but for some reason other's couldn't. Big What you can't see can't hurt you size hugs to you. Those are cute! I like the camo wrapper. I posted a chocolate recipe on my blog today! How fun! I want some cool choco bars! I miss Safeway! But maybe I can find them somewhere else. Have a wonderful weekend. Everytime I come to your blog it makes me so hungry for chocolate....YUMMY!!!! The chocolate bars are really cute...we don't have Safeway. LOL, the first one is my favorite! So I see your easing up to almost 100 followers! You go girl! Are you going to give me something when you do? LOL. Oh I finished your scarf! YEah!!!! Now I just have to put your package together. *sigh* I'm so bad! Hugging you my busy friend.